Fernbank Museum of Natural History opened it's doors in 1992. Only at Fernbank Museum can you come face-to-face with the world's largest dinosaurs, explore the development of life on Earth through the landscapes of present-day Georgia, connect with cultures from around the globe, engage in a variety of hands-on exhibitions and more! Several times a year Fernbank also offers an amazing special exhibit. And you definitely won't want to miss the 5-story experience of an IMAX film. We love science and Fernbank is one of our favorite science museums in Georgia. This amazing museum offers something for everyone. There are 3 levels each featuring amazing exhibits. There is also an fantastic interactive play area, IMAX theater, cafe and two gift shops. The permanent exhibits include World of Shells, A Walk Through Georgia, Sensing Nature, Reflections of Culture, Curator's Corner, Conveyed in Clay, The Star Gallery, Giants of the Mesozoic and the Dinosaur Plaza. Throughout the halls you will also find displays featuring native animals of Georgia and beautiful nature artwork and photography. 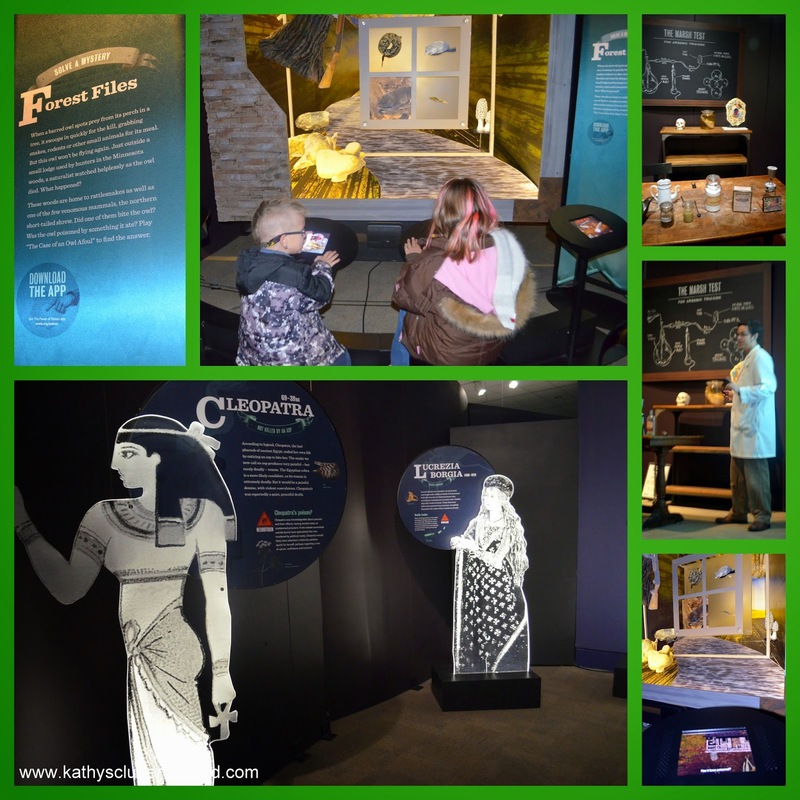 About 3 times a year Fernbank features a special traveling exhibit in their 12,000 square foot exhibit area located on the lower level. 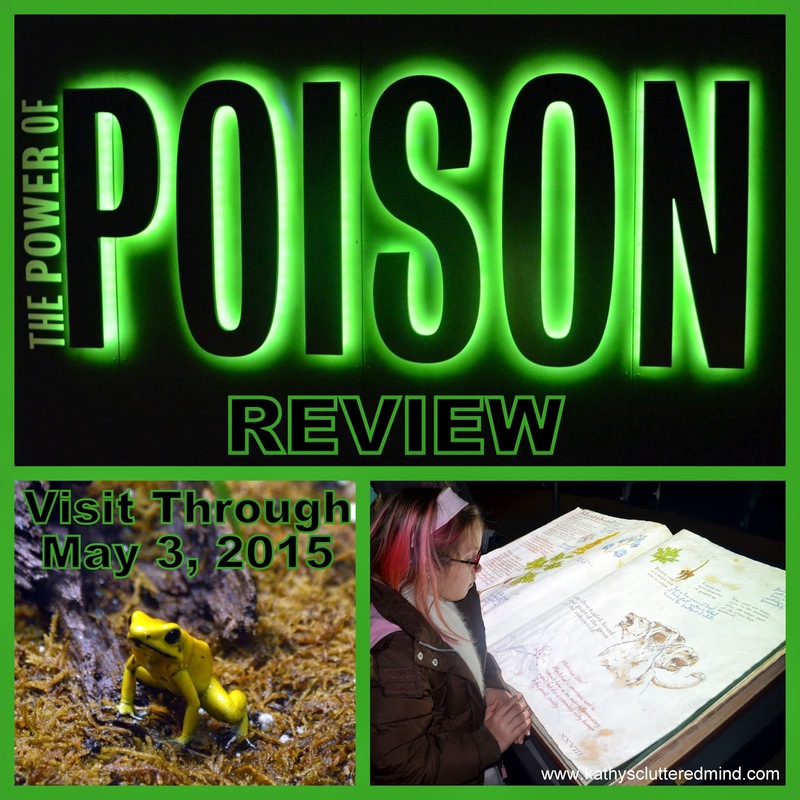 Right now The Power of Poison is on display through May and is a MUST see. This new exhibit offers something for both young and old. Who knew poison could be so much fun and educational! The exhibit is broken up into four sections: poison in nature, poison in literature, detecting poison and poison for good. The exhibit starts you out in the remote jungles of Columbia where you will travel through the Choco rain forest and learn about how the plants and animals there use poison for survival. There are golden poison frogs, deadly vines, giant ants, slithering snakes and more. Don't worry most of the items are models and not harmful. 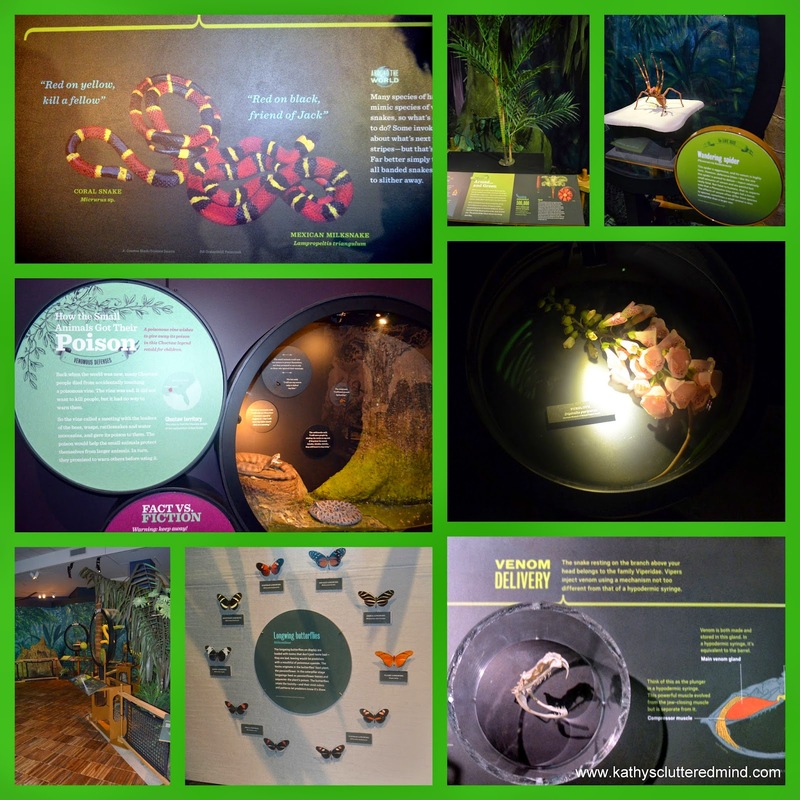 Throughout this section there are giant scale models giving you an up close look at the poisonous details and placards explaining scientific information, facts, and more. Next up we stepped inside the pages of fairy tales and other literary works of art. This was the kids favorite part of the exhibit. 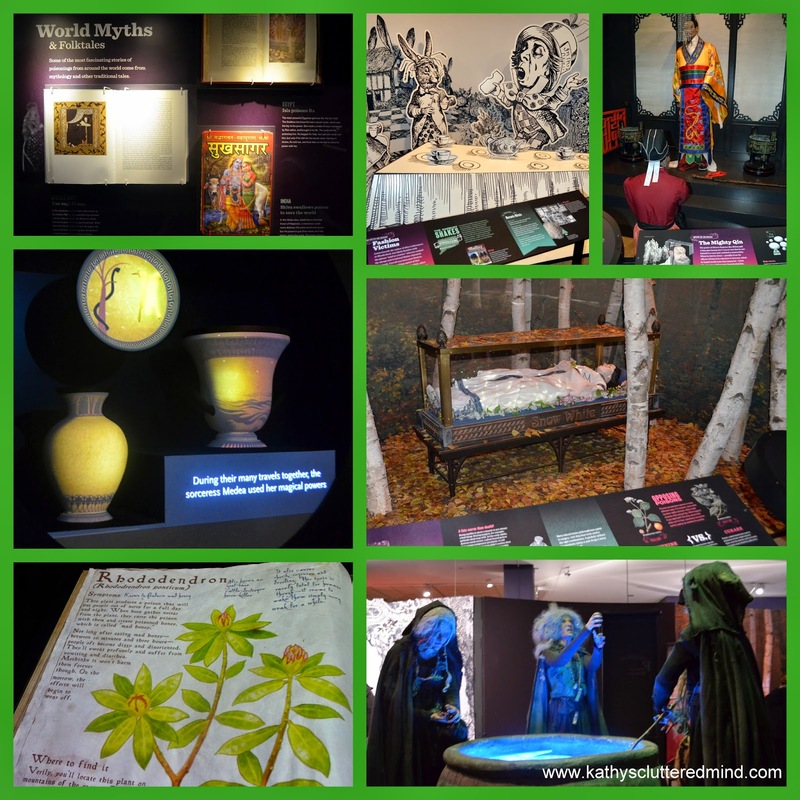 This section stars well know characters like Snow White, Romeo & Juliet, Alice and Wonderland, Emperor Qin, Harry Potter a gathering of witches, Medusa and more. We spent the most time in this section paging through the interactive spell book. This book used amazing technology to make this enchanted spell book come to life. You can check out the book here. Next up we learned all about how to detect poison. First we walked through a section on villains and victims where we learned about historical figures like Nero, Cleopatra, Lucrezia Borgia, Napoleon and Ponce de Leon. All of these famous people from history were either allegedly killed by poison or used poison to kill someone. After we learned some amazing history we sat down to help solve a poisoning case from history. We learned all about arsenic and how they used to and currently test for arsenic. After the show we headed over to the 3 interactive accidental poisoning investigation sections to become super solving sleuths. You can download the iPad app to solve the 3 cases here too. The final section of the exhibit covers a more lighter topic which is how we use poison for good. It highlights the various toxins found in nature that save lives on a daily basis. You will discover how some poisons have become key players in the advancement of new medicinces, like foxglove and sweet wormwood. There is one last little section where younger children (and even older children) can have fun playing with the puppet theater and reading some classic myths, fairy tales and legends. 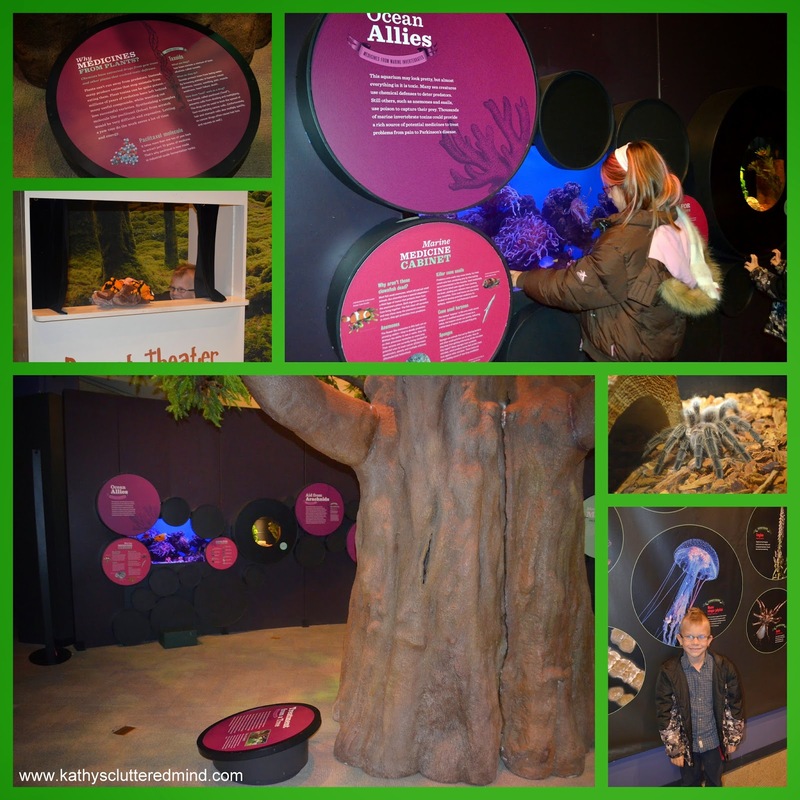 The exhibit creates and engaging and immersive environment that is interactive, educational, and fun. Homeschool parents and educators be sure to download the educator guide and resources before visiting. -Be sure to download Fernbank App to your phone which will help you navigate the museum and exhibits. -Photography is allowed in all exhibits..
-There are two gift shops with really cool items. Watch your children there are breakables. -Parking is free and there are two large lots. -There is a cafe in the museum with a large cafeteria and patio area for eating. Children's meals are about $6.75. However Fernbank does allow packed lunches to be brought into the museum and eaten in the cafeteria or patio area. -Military, Morgan Staneley and Seniors may be eligible for special offers. -Group rates are available for birthday parties, school groups, etc. -Homeschoolers are eligible to receive up to $50 off a Museum membership with an Educator Membership. Just show declaration of intent. The museum and IMAX are open Monday through Friday, 10am to 5pm; Saturday, 10am to 5pm and Sunday, noon to 5pm. The Museum is open 363 days a year, closing Thanksgiving Day and Christmas Day. *Homeschool day prices are $18 for adults and $7 for children. Homeschool days are offered 2 times a year.